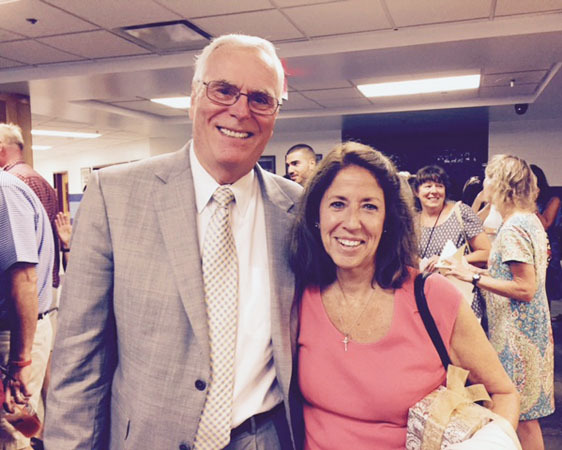 Dr. Canfield, Superintendent, poses with Karen Slagle, Forestdale's Teacher of the Year. So today presents an exciting moment for me. In the two previous years that I’ve had to do this speech and introduce this particular award, I’ve never really known the person that I was talking about. That is different this year with thisyear‘s Forestdale School Teacher Of the year; I did have the privilege of working with this teacher last year. The unfortunate part for me is that I will not get to work with this person next year. How do you sum up all of a person’s qualities in 3 minutes? Especially when we get to work with an entire faculty that is of such high quality. I decided to focus on one of her many great qualities. The quality that stands out above all others is her strong commitment to developing her students as people. She cares very much about how her students see themselves as learners and as citizens. She teaches them to value the community that they live and to learn about who they are as people and how they can best express themselves and their individuality. Along those lines, the Forestdale school teacher of the yearalso dedicated herself to the school beyond the classroom as the director of the falcon theater company this educator dedicated countless hours to the students of Forestdale to put on a fantastic production of the little mermaid this pastyear. Attending opening night, I was awestruck by the poise, commitment and overall quality of performance that the students Demonstrated. Additionally, I was so impressed by the number of students that participated in this performance. This serves as another example to this teacher’s dedication to creating opportunities that allow the whole child to develop. This year‘s Forestdale school teacher of the year is Karen Slagle!